Image above is a photo-real rendering of home. Stately home in Ocean Ridge Plantation features brick exterior with James Hardie accents, custom stained garage door, and a tongue & groove front porch ceiling! The open floor plan is accentuated by 12' vaulted ceilings and custom trimmed beams through the Great Room and Kitchen. Kitchen has an oversized island, Eudora cabinets, stainless steel KitchenAid appliances and large pantry. Formal Dining with coffer ceiling is accessible from the Butler's Pantry! Private Master Suite has large walk-in closet with custom shelving. Enjoy a luxurious Master Bath with a full tile shower and soaking tub. Bedrooms 2 and 3 on the 1st floor. Laundry doubles as an office with desk area and open shelving. Solid core doors throughout for added privacy! All Riptide homes are HERS Energy Certified and feature a Navien Tankless Gas Water Heater . Head east on Sunset Blvd N toward Park Rd SW. Turn left onto NC-904 W Seaside Rd SW. Pass by Hardee's (on the right). Turn right onto Old Georgetown Rd SW. Turn left onto Dartmoor Way SW. Turn left onto Summerhill Glen SW. House is left. Prices, promotions, incentives, features, options, floor plans, elevations, designs, materials and dimensions are subject to change without notice. Square footage and dimensions are estimated and may vary in actual construction. Actual position of house on lot will be determined by the site plan and plot plan. 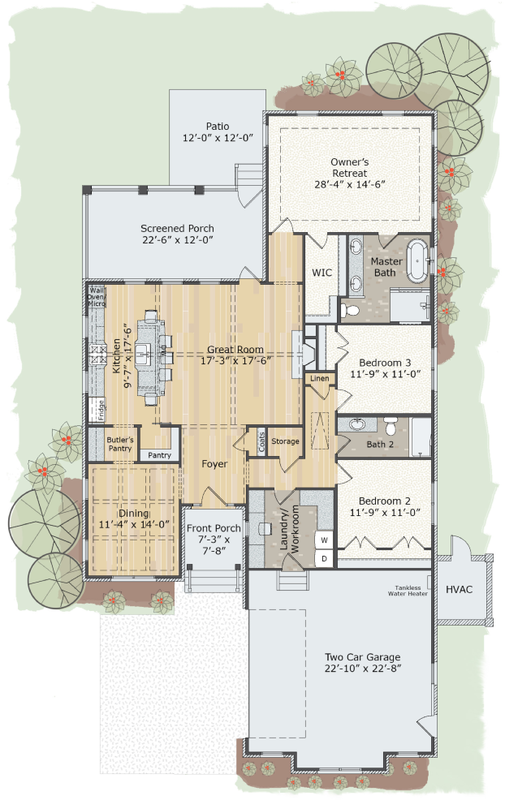 Floor plans and elevation renderings are artist conceptions. Riptide Builders, LLC NC Unlimited Contractor License #70409. We reserve the right to make changes in the plans, specifications, materials, and substitute material of similar quality. All dimensions and square footages are approximate. Landscaping depicted is for illustrative purposes only. The information contained herein is believed to be accurate, but is not warranted. Floor plans depicted are artistic renderings or similar photos and may differ from actual construction blueprints. Prices are subject to change without notice. Photographs, graphics, videography or other similar reproductions or recordings contained on this website may not be copied, altered, or modified without the expressed written permission of an authorized designee from Riptide Builders, LLC. Equal Housing Opportunity. Riptide Builders, LLC has an affiliated business agreement and ownership in Riptide Sales Team, a licensed Real Estate Brokerage in North and South Carolina.